With the railroad freight business dwindling, it looked as if the carferries were headed for the scrapyard. C&O dropped both the Milwaukee and Manitowoc runs, and even offered to give the boats away. 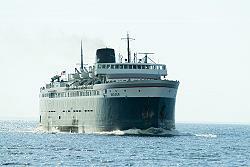 Finally in 1983, in order to save the ships, Glen Bowden and a group of Ludington businessmen bought all three carferries--the Badger, Spartan and City of Midland--for one dollar each. 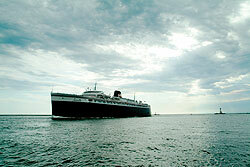 Their new company, called the MWT (Michigan-Wisconsin Transportation), struggled to keep the ships going, but in 1990 the carferries were permanently docked, with the fear they would never sail again.